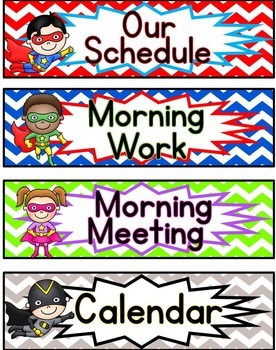 A visual schedule is an important component of an organized classroom. Students like knowing what to expect, and having a posted schedule reduces the amount of, “What are we doing next?” questions. This set of 68 completely editable schedule cards is ready to print on cardstock and either stick to a magnetic board, (with magnetic tape on back), or tuck into a pocket chart. The graphics are secure, but there are editable text boxes for every sign with suggested text. 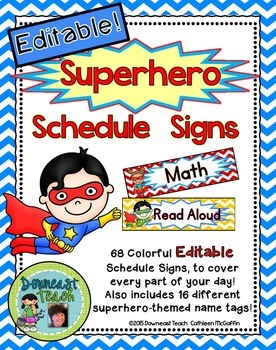 As long as you have PowerPoint, you can move, copy/paste, and edit the text boxes to create just the signs you need for your class! 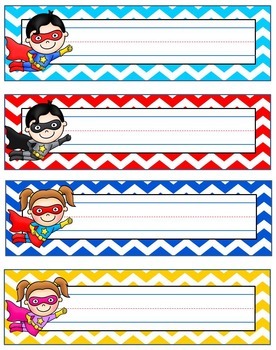 Also included in this file are 16 different superhero-themed name cards. Group Activity Guidance Guided Reading Guided Math Gym/P.E. 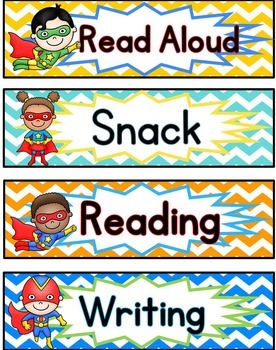 Special Event Specials Spelling Star of the Week S.T.E.A.M. S.T.E.M. • Look for the green star near my logo on any page within my store.